Extra Fruit Jams are no ordinary jam, inspired by traditional recipes, superior quality and taste! Granny's Secret Extra jams & Fruit spreads: Our Extra Fruit Jams have a high fruit content of 60-80%, much more than other brands, giving a wonderful burst of fruitiness! 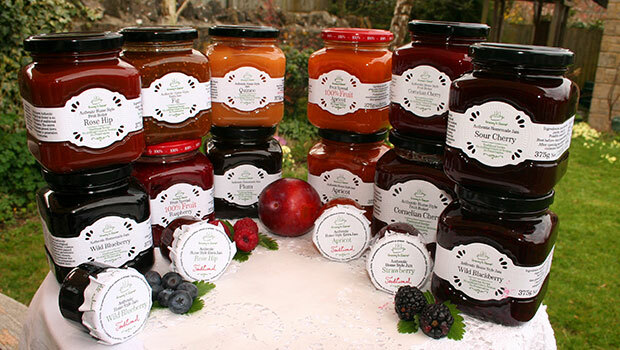 The Extra Fruit Jam range is prepared exclusively by skilled staff as in a domestic cooking environment, following generations' of recipes and methods. The fruits are naturally harvested and only the best are cooked at source to bring you this delicious spread. No compromise is made; no additives, no artificial colours or flavours. So, you can enjoy this flavour-full jam with the confidence you are eating the best. Flavours: Our range comes in Strawberry, Orange, Apricot, Plum, Fig, Raspberry, Wild Blueberry, Quince and Rosehip. Allergy Information: Nut free, gluten and dairy free, free of any preservatives, artificial colours and flavours. Suitable for vegetarians and vegans. Shelf life & packaging: 2 Years shelf life. Sold in 240g jars with 9 selected flavours. Awards: We won the Bronze Artisan Marmalade Award 2014 in Dalemain Cumbria, for our Orange Jam. The highest marks were given to the appearance - colour and aroma of a Seville orange. Great Taste Awards :Orange jam was also granted 2 Gold Great taste award stars in 2014. Serving suggestions: Rich in fruit content, they can be used as traditional jams but due to their slightly less sweet character they also make wonderful compotes, sauces for savoury dishes, baking accompaniments, or in yogurts etc…. I have been searching for this taste for years! Just bought and tasted your apricot jam from store in Melbourne, I nearly cried. It's sensational. I have been searching for this taste for years. I have tried hundreds of brands of apricot jam since 1980's, searching for that taste, and today I found it. Having looked at your website, I see the Serbian connection may be the secret! Thank you. Don't stop making it and sending it all this way. Though all jams contain a lot of sugar, cherries are the one fruit that seem to counteract this and having tested this over many weeks, this jam is little sour but being wonderfully tasty at the same time. I am from eastern Europe where rose hip jam is treasured like gold (if you ever tried to pick and clean rose hips, it is easy to understand why), so when I stumbled across this reasonably priced product I got quite curious and bought a couple of jars. It tastes exactly like my gran's, top quality. Granny's Secret Extra Jam Cornelian Cherry is delicious for both sweet and savoury purposes: makes a fine accompaniment to savoury dishes such as poultry, lamb or mixed cold cuts and pâté (whether meat or mushroom).This is also a good fruit butter to serve with cheese as an option to quince paste or other fruit butters. If the fruit butter is mixed with a little red wine vinegar it makes a pleasant, tangy salad or vegetable dressing with an appealing colour. Granny's Secret Wild Cranberry jam is absolutely delicious. Fantastic!!! Five stars for Granny's Secret Fig Jam! Granny's Secret Quince fruit spread tastes just like my mother used to make!!! Scrumptious!! It doesn't get better than this! I love to call this jam-fruit Nutella :-) beautiful and smooth consistency , very tasty jam and with 91g of fruit per 100g it makes it healthy too ! You should try it.! Granny's Secret Rosehip Jam is pure Heaven - tasty and no artificial nonsense - will certainly buy more! Just a humble consumer here, having recently discovered the delights of your extra rosehip jam. I usually make my own rosehip jam which never last me very long and I've always been dissatisfied with bought versions as I find them far too sweet. Where can I find more of your jams? I just received the samples! Looks really good and the jars are just beautiful! I am frankly over the moon with the presentation and more importantly the taste. In-fact 'I’ve had never tasted any jam that was that good'. When we opened a jar of the marmalade -me and my his family enjoyed it so much that the whole jar was emptied under one hour. Now that to me speaks volumes.